A JOINT VENTURE - The Maran Group & Astro All Asia Network Plc, Malaysia joined together on 16th February 2005 to provide DTH services in India, thus forming SUN DIRECT TV PVT LTD.
Sun Network is a Rs 16000-crore (4 BillionUSD) Established in 1992, it offers a plethora of television channels in 4 languages covering South India. It was the first fully privately owned Tamil channel in India when it emerged in 1992. No.1 commercial Radio broadcaster in Malaysia. No.1 Malaya, Chinese & India Radio Stations. 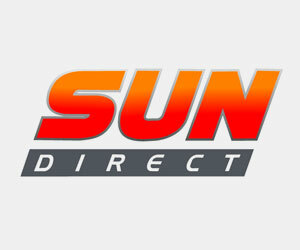 Sole DTH broadcaster in Malaysia and Brunei and one the largest DTH broadcaster in Asia. Amrita TV is available in the Free Pick Basic Package on Sun Direct in all languages.